Ellen White, a continuing, authoritative source of truth, was the prophetic voice whose writings determined Adventist biblical interpretation (see Seventh-day Adventist Fundamental Beliefs, number 18). Adventism was founded on date setting and a refusal to repent from that error. The Adventist Clear Word Bible paraphrase adds Adventist doctrine to the Bible and is sold in some Christian (not only Adventist) book stores. Investigative judgment (central doctrine of Adventism) says Jesus’ atonement was not finished at the cross. Soul Sleep doctrine says humans have no spirit but “breath”. They die like animals and the resurrection is a re-creation out of God’s memory, not the “real” person being brought back to life. The man Jesus likewise was merely “body plus breath”. This doctrine denies the biblical new birth, or the regeneration of our dead spirits by the indwelling Holy Spirit. They teach the new birth is a change of belief or attitude that happens in the cognitive mind. “The Health Message” advocates the levitical food laws of the Old Testament and promotes vegetarianism or complete veganism. This teaching aligns with their belief that man has no “spirit”, so a healthy body and brain are necessary in order to properly “hear” the Holy Spirit. The Health Message further denies Mark 7:19 where Jesus declared all foods clean. “Remnant church” status separates them from the Body of Christ. Adventism teaches that it is the only true remnant church of Bible prophecy. Reflected in their Fundamental Belief No. 13, “remnant theology” really teaches that all churches that worship on Sunday are a part of the “widespread apostasy,” “Babylon”, or the “daughters of Babylon”. So even though Adventists acknowledge that God has His children in all churches, they add, “but through the remnant church He proclaims a message that is to restore His true worship by calling His people out of the apostasy and preparing them for Christ’s return." 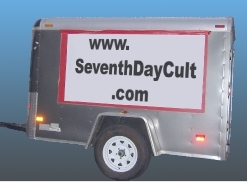 John MacArthur calls Seventh-day Adventism a cult. Did you see the CARIS trailer in Lancaster? Former Adventist pastor Dale Ratzlaff spoke at Calvary Chapel in Lancaster on Sunday, Sept. 13, 2009. Most Millerites repented and returned to their churches of origin. Why do we publish this information?